James Hoffman is professor emeritus of theatre at Thompson Rivers University in Kamloops, British Columbia. His research specialty is the theatre history and culture of British Columbia. He has recently been examining the relationship between professional theatre companies in small cities (Kamloops, Prince George, Nanaimo) and their communities. His latest publications include editing of "Whose Culture Is It, Anyway? Community Engagement in Small Cities" (New Star Books, 2014) and an essay, “Performing Community Action in the Small City: The REDress Project in Kamloops,” in the book, "Animation of Public Space through the Arts, Toward More Sustainable Communities" (Almedina, 2013). He has co-edited "Playing the Pacific Province: An Anthology of British Columbia Plays, 1967-2000" (Playwrights Canada Press), Alan Filewod's "Performing Canada: The Nation Enacted in the Imagined Theatre" (TSC Monographs), and edited "George Ryga: The Other Plays" (Talonbooks) and "George Ryga: The Prairie Novels" (Talonbooks). Hoffman was born in Victoria BC in 1943, educated at University of Victoria, then at New York University where he obtained his Ph.D in theatre history; his dissertation is entitled "A Biographical and Critical Investigation of the Stage Plays of George Ryga." He taught post-secondary theatre courses at the David Thompson University Centre in Nelson, East Kootenay Community College in Cranbrook, and Thompson Rivers University in Kamloops, where he became chair of the Visual and Performing Arts Department and co-director of the Community-University Research Alliance, which focused on the study of the culture of small cities. He achieved the designation of full professor in 1995 and professor emeritus in 2012. A selection of other major publications includes: "The Ecstasy of Resistance, A Biography of George Ryga," Toronto: ECW Press, 1995; "Biocritical Essay" in The George Ryga Papers, University of Calgary Press, 1995; "Genre Contention at the New Play Centre," in Theatre Research in Canada, Vol. 16, Nos. 1-2; "Theatre" entry in The Encyclopedia of British Columbia, Vancouver: Harbour Publishing, 1999; "Subverting Modernisms in British Columbia: Christopher Dafoe at the Vancouver Sun, 1968-1975," chapter in "Establishing Our Boundaries: English Canadian Theatre Criticism," Toronto: University of Toronto Press, 1999; and "Shedding the Colonial Past: Rethinking British Columbia Theatre," in BC Studies 137 (Spring 2003). He has also written program notes for many plays staged by Western Canada Theatre in Kamloops. He is now living in Victoria where he has donated his collection of British Columbia Theatre History Papers to the University of Victoria Library. His George Ryga Papers have been donated to the University of Calgary Library. He is a member of the Canadian Association for Theatre Research and the Canadian Theatre Critics Association. Fonds consists of materials to Hoffman's professional and research activities and reflects his involvement in the BC theatre community. Topics include: aboriginal performance, Carroll Aikins, British Columbia Theatre Conference, British Columbia theatre history, Llewelyn Bullock-Webster, Hamasta ceremony, Inkameep School, New Play Centre, "Nootka Sound , or Britain Prepar’d,""Oxford Companion to Canadian Theatre," "Playing the Pacific Province," Sydney Risk/Everyman Theatre, Theatre Energy, Theatre North West, Theatre One, Vancouver theatre history, Victoria theatre history, and the Western Canada Theatre (Company). The fonds includes video recordings from the BC Theatre Conferences and audio interviews with Burton Lancaster, Garry Davey, Catherine Caines, Donna Spencer, David Ross, Robert Simon, Len Marchand, Ken Fayrholdt, Ann Adamson, Peggy Bernier, Judith Ceroli, Dorothy Davis, Nick Hutchinson, Cathy Marrion, Mavor Moore, and Phoebe Smith. 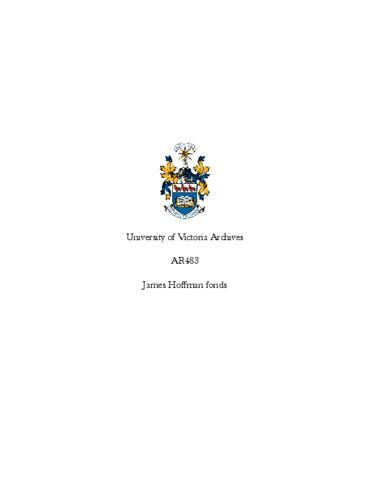 Fonds was donated in to Special Collections and University Archives by James Hoffman in 2013. The collection includes materials created and compiled by James Hoffman such as taped interviews with George Ryga and his family members, materials provided by his wife following Ryga's death in 1987; video recordings of performances of Ryga's works, video recordings of Ryga by media producers, correspondence with Ryga and others about Ryga, reviews of Ryga's work, programs of performances; photographs and some personal records of Ryga's.